In October 2015, I traveled to Beijing along with thirteen fellow online MBA students from Kelley Direct to gain a better appreciation of how to successfully do business in China. 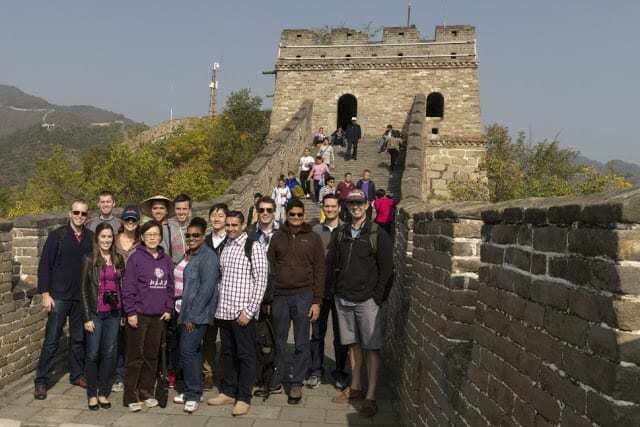 This in-person portion of the Accelerating Global Immersion Leadership Education (AGILE) program represented the final module for a nine-week course focused on international business strategy; the lessons from the classroom were reinforced through a series of lectures at Peking University and numerous company visits across the city. One of the most impressive things about Beijing (and China in general) was the spirit of entrepreneurship and growth coming from everyone we met. Contrary to our expectations of the Chinese business environment being highly controlled and inefficient, we instead found ourselves in a country where the default mindset was that anything was possible. The Chinese market is really one where innovation rules. But it is not the kind of innovation that we think of in the United States. In China, “zero to one” innovation (meaning the development of totally new, untested products) is unnecessary and likely destined to fail given the reliance upon the relatively conservative state for funding and support. In China, the preferable model is the “one to ten” model (or even the “ten to one thousand” model”) where a proven idea can be ramped up and sold in extremely high quantity very quickly. 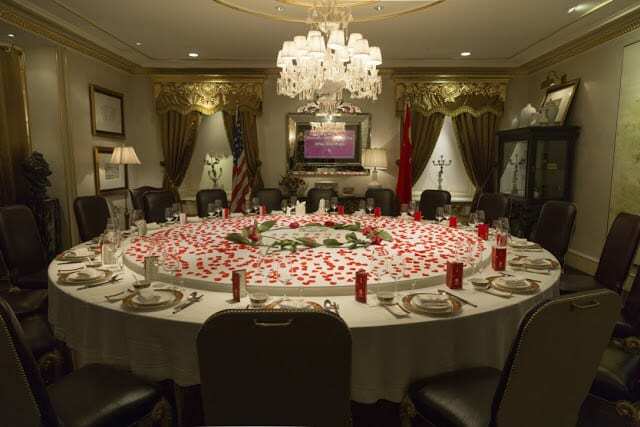 We visited many businesses while were in Beijing including a fast-casual salad restaurant, a lighting, and signage company, a water purification, and waste management company, a corporate gifts vendor, and a luxury rosewood furniture dealership. None of them were particularly innovative, at least compared to their Western counterparts. When we speak about “leapfrog” technology, we often focus on consumer goods like cellular phones. However, what was evident to me was that this “leapfrog” equally applies to business processes, which allows start-ups In China to start out with “best in class” capabilities right from the very start. Coming in as a Westerner wanting to do business in China, one of the biggest strengths you bring to the table is your ability to help your local Chinese partners build these capabilities. Chinese consumer culture was something to behold. It was very easy to forget that we were in China while walking around Beijing; it seemed like everyone was dressed in Polo or Vineyard Vines shirts and smart jeans. It did not feel like we were in a developing market, aside from the ever-present smog that some days made it nearly impossible to see across the street! Despite all of the displays of their newfound wealth, the middle class in China has an extremely low investment rate. The recent stock market downturn hardly seemed to impact people in the street, primarily because so few people were invested in the market. Chinese consumers tend to save money as opposed to investing; and (somewhat confusingly) they see the purchase of consumer goods as a safer option for money than the stock market. Part of this reluctance to spend is cultural; the older generations in China remember famines and periods of major political upheaval, and tend to believe that the only way to ensure a life for a family is a large “nest egg”. The savings rate in China is something like 50% of GDP, almost triple that of the United States. So, for all of the growth of consumer spending in China in the last few decades, there remains a huge untapped source of capital that is currently being held out of the financial system. Restricted Movement: Many rural Chinese are barred from living in the cities in China due to overcrowding and employment concerns. To skirt these restrictions, companies provide housing for their employees to “fast track” their access to the city. This creates a situation where employees literally live where they work and lose any sense of job mobility. Although shocking to us from the U.S., this practice is widely seen as an opportunity for rural villagers who may otherwise not have a chance to move into the middle class. Price Controls: In China, you will never see a price listed outside of a gas station. There is no need; the petroleum industry, like many other strategically important industries, is still state-run. There is no need for gas stations to advertise prices because they are set by the government and are thus the same everywhere across Beijing. Language Barriers: The Chinese are more well-versed in English than most Westerners are in Mandarin, but that does not mean that you should expect to be able to have a conversation with the average Beijing resident. Official translations were often garbled (some favorites included signs at parks instructing the reader not to “dig or eat wild herbs” and a jacket with the alarming “poot super” message) and dealing with cab drivers or merchants on the street was more often than not an exercise in sign language and pantomime. While this will improve over time, non-native speakers should be wary of doing business deals in China without having a trusted translator available. The Importance of Government Support: Startup capital is everywhere in China yet strangely unavailable at the same time. The government controls the spigot, and thus any venture in China requires a good deal of approval and partnership with the local government. Many of our host companies had executives who in previous stints had worked in the government. Having connections in China – known colloquially as guanxi – is often the key to ensuring success. We learned this in a very memorable way at dinner with our executive hosts, who insisted on ensuring that a gambei (toast) was made with every member of the class individually! Looking to the future, much of what we heard about China’s long-term prospects sounded very similar to the issues faced by the United States today. We heard concerns about funding pension schemes with a gradually shrinking and aging population; there were worries about the environment given the rapid industrialization of the country; and there is a fear that as labor costs continue to rise, companies will abandon China for cheaper production elsewhere. The very solutions to these problems being developed in the United States today will be critically important in China in the not-too-distant future. Not only did we take advantage of the opportunity to meet Chinese nationals during this trip, but we also made the best of meeting our Kelley classmates in person as well. One of the most critical aspects of the AGILE study abroad courses (and what sets Kelley Direct apart) is the opportunity to merge the online classroom with real-life interaction. We had an incredibly fun and diverse group and all of us left with new friends and business connections that we will be helpful in the future. Traveling to the other side of the world together also gave us a bond and stories that we’ll be telling years from now. 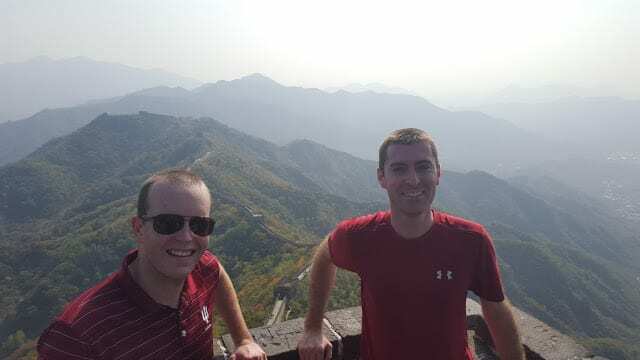 Dave and I did make it to the very top though, and despite the dripping sweat and outright exhaustion did manage to show off our Hoosier pride to the whole of China. It was a high point (literally!) of the entire trip, and I can’t express enough how grateful I am to be a part of a business program that provides these kinds of once-in-a-lifetime opportunities for its students. I’ve traveled the world thanks to Kelley and I wouldn’t trade the experiences here for anything! Christopher Reid is a consumer goods and services consultant with Accenture based out of the New York metro office. He has worked in the consumer packaged goods industry for close to a decade, supporting supply chain, sales, and marketing projects for several billion-dollar international brands. He graduated from Indiana University with a BS in Operations Management and Business Information Systems and a BA in Spanish in 2007. Christopher returned to IU and the Kelley School of Business in 2012, where he is currently pursuing a dual degree MBA and MS in Marketing through the Kelley Direct program. AGILE China was Christopher’s third study abroad program through Indiana University; he spent a semester in Madrid, Spain during his undergraduate studies and participated in an AGILE program in New Delhi, India in February 2015.